ISLAMABAD, (SANA): The Second Session of the Pakistan-Turkmenistan Joint Governmental Commission underlined necessity to accelerate efforts for TAPI gas pipeline project in order to begin construction of this gas pipeline on priority. 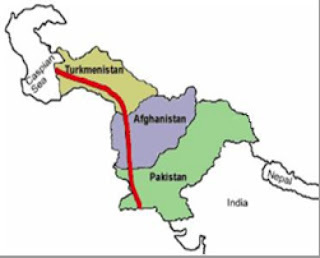 Turkmenistan side informed that they have initiated to organize the Steering committee meeting of the TAPI gas pipeline project on 15-17 September, 2010 in Ashgabat which will approve and initial the texts of relevant Agreements and multilateral documents by all the four countries, i.e. Turkmenistan, Pakistan, Afghanistan, and India. The Second Session of the Pakistan-Turkmenistan Joint Governmental Commission was held in Islamabad on 24-25 August, 2010.The Pakistan delegation was led by Nawabzada Malik Amad Khan, Minister of State for Foreign Affairs and the Turkmenistan delegation was led by Mr. Rashid Meredov, Vice Premier/Minister of Foreign Affairs of Turkmenistan. Formation of Joint Working Groups in the areas of Trade and Commerce, Agriculture, Science & Technology and & Power sectors for identifying areas of mutual cooperation and making concrete proposals to enhance the level of cooperation between the two countries in these areas. Pakistan side handed over draft of MoU on cooperation between Chamber of Commerce & Industry (CCI) of Turkmenistan and Trade Development Authority of Pakistan (TDAP) for participation in Trade Fairs, Expo and Exhibitions in both countries. Pakistan side also presented proposal for bilateral cooperation for import of gas from Turkmenistan. Turkmenistan also offered export of at least 1000 MW electricity to Pakistan. A Joint Working Group between relevant organization has been established which will start deliberations on this subject. Both sides agreed to establish academic links between renowned educational and research institutions of their countries. Both sides also discussed the prospects of future cooperation for export of medicines and surgical equipment from Pakistan. Pakistan side proposed that shipment in bulk can be repacked in Turkmenistan according to the Turkmenistan’s norms and specifications. Both sides identified their focal points for exchange of information in areas of mutual interest of Science and Technology. Meetings of experts will be held soon to prepare a Programme of Cooperation. Both sides agreed to prepare by the end of 2010 the draft of the Cultural exchange Program between two countries for 2011-2013. Pakistan side presented a draft Agreement on collaboration between “Associated Press of Pakistan” (APP) and Turkmenistan’s news Agency “Turkmen State News”. The leader of the Turkmen delegation also made official calls upon President of Pakistan, Prime Minister, Foreign Minister, and Minister for Petroleum & Natural Resources and discussed matters of mutual interest and regional importance.